Just heard about your great products. Hull currently has intecoat bottom kote. Can I apply your VS721 over this? What prep? Upper hull: badly oxidized red, now pale orange. How can I restore. Where can I buy it in Montreal. Our VS721 cannot be applied over anti-fouling paint. It must be completely removed and the VS721 applied to a clean fiberglass surface. 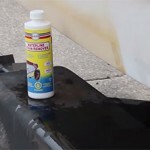 If your hull is so badly faded, I suspect that there is no color left to restore and you will have to refinish with gelcoat, or paint, to get the color back. 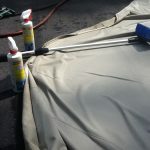 If you want to try a small area to see if you can get the color back to where you will be happy with it, you can try rubbing it with Boat Scrub, rubbing compound or 600 grit wet dry sandpaper (wet). If the color comes up, continue with the rest of the boat. After, protect the finish with Premium Boat Shine or another boat polish. Try to avoid products with Carnauba Wax. Keep in mind that when you restore badly faded fiberglass, you will need to re-polish every two months or so as it will not last as long as new fiberglass or fiberglass that has been looked after and is in good condition.